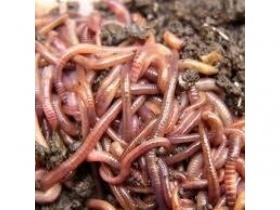 We breed worms on our farm in Worcestershire, that you are welcome to visit. The worms are hand harvested on the day of dispatch and sent out to you in a bag with bedding culture taken from our breeding beds, the worms will be a mix of young and mature worms. The bedding is an environment the worms are used to and happy to live in. It contains all the nutrients the worms need to keep them happy for several weeks. The bedding is also teeming with all the beneficial micro-organisms that are necessary to get a wormery or composting system off to a great start, it will also contain worm cocoons so your worm population will soon expand. The worms will be a mix of sizes.